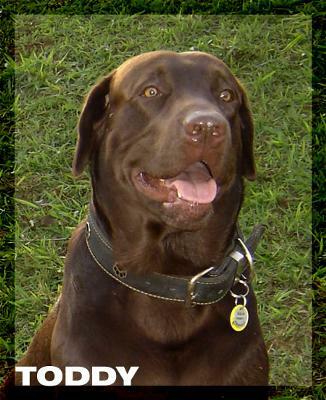 This chocolate labrador is a male ,five years old and we live in São Paulo, Brasil. I don´t speak well English,so I´ll try to write the best possible I can. My name is Ginalda Mizuno and I love this lab, it´s my passion. The owner is my son Daniel. To me, Toddy is the most beautiful choco I had seen.He came to us with 63 days and after 2 days he stay ill with parvovirose but of course, it survives. It is my first lab ,he loves me more than anything in this world.Since he came,I had been stayed on his side all time. I just lost my best friend.her name is Angel. I got her when she was 5 weeks old.she died nov.16,2011 at 4.30pm.angel lived 10 years n 5 months. I will miss her so much.Angel was born outside,but when she came home with me,she slept in a king size bed.ANGEL started out having a tumor in her belley removed in jan.2010.then in her health started going down hill. she had kidney failure.that was the hardest thing to see.but 2 weeks before that Angel couldnt walk.that was very sad watching my baby go through.but i know in my heart ANGEL lived a happy life. i love her very much.n she will be greatly missed.i was with her when she died.it tore me up to see her go. Your English may be a little rough but your love for this beautiful lab is understood. I just lost my lab after her companionship for 14 yrs. I miss her terribly, every day. Toddy is beautiful! He looks like a very happy dog.